May 16, 2016 – A 3-D animation created by NASA’s Scientific Visualization Studio using data from the MAVEN mission to Mars is the corporate winner of the inaugural Data Stories video contest sponsored by Science magazine for videos that tell stories about data. Created from research conducted by the entire MAVEN team, the video also won the People’s Choice award voted on by social media followers. The video explains how the solar wind is driving particles from the upper atmosphere of Mars into space, which may have caused the planet to dry out and cool over the eons. Scientists have long suspected the solar wind of stripping the Martian atmosphere into space, a process that may have changed Mars from an early, warm and wet environment that might have supported surface life to the cold, arid planet Mars is today. 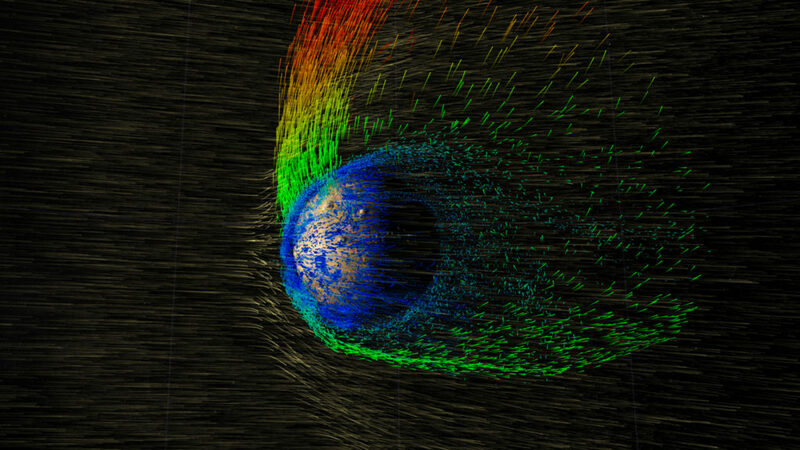 In October 2014, MAVEN arrived at Mars and began studying its upper atmosphere. The MAVEN team has now identified the process that appears to have played a key role in the evolution of the Martian climate. Data from the orbiter have enabled researchers to determine the rate at which the Martian atmosphere currently is losing gas to space via stripping by the solar wind. There are roughly 30 scientists, graduate students and undergraduates from the Laboratory for Atmospheric and Space Physics who are on the science team and analyzing the MAVEN science results. CU-Boulder provided two science instruments and leads science operations as well as education and public outreach for the mission. LASP’s Nick Schneider, Frank Eparvier and Robert Ergun all head up instrument teams on NASA’s MAVEN project. Bruce Jakosky is the principal investigator.